Fat grafting is also called fat injection. This surgical procedure is used for sculpturing of facial contour. The procedure is proceeded by harvesting a patient’s fat, purifying it, and re-injecting the purified fat with syringes into every area of skin that a patient needs fat injection. Almost every area of face except cheek and chin bone, this simple micro-fat injection surgery enhances your facial beauty. As this procedure is very easy and simple and there is scarce adverse or side effect, this surgical procedure is one of the best facial sculpturing treatments and there are many advantages because natural correction is feasible in any facial area that you want. In the past, conventional fat grafting extracted fat lump and simply put into subcutaneous area, which had many disadvantages; implanted fat took up so much space around rarefied vessels and provided poor environment for the survival of implanted fat. There is too high rate of absorption of implanted fat, which could not provide satisfactory and aesthetically pleasing result. Recently, however, the way of new fat injection method, so called ‘micro-fat injection’ is developed. Micro-fat injection has many advantages; this method uses highly purified and centrifuged fat, which increases the rate of survival of fat and gives aesthetically pleasing result. This micro-fat injection also uses very fine syringes to inject fat tissue into human skin and subcutaneous tissue that gives less pain and even no pain to patients during the procedure. As fat is acquired from patients from themselves, implanted fat well adopt to the injected area of the patient. Moreover, micro-fat injection has anti-aging effect. Aging process makes our wrinkles and changes our facial configuration; Soft tissue of cheek is depressed and overall skin and soft tissue of our face are gradually drooping. This phenomenon appears because of the loss of subcutaneous fat in face and atrophy of facial muscle. Occasionally, we can observe depressed forehead or asymmetric cheeks even in young peoples. Although many filling materials such as Restylene and Juvederm can be used to correct depressed volume of face or wrinkles, the cost is very high because the treatment requires a large amount of fillers to cover the all depression of soft tissue in one’s face. Accordingly, this kind of filling material is only suitable for correction of fine wrinkle. Therefore micro-fat injection is the most appropriate, long-lasting, easy, and simple method of surgical procedure for the patients who require great amount of filling materials or who don’t want aggressive bone sculpturing surgeries for their face. As patient’s own fat is harvested and injected, there are scarce adverse effects. The procedure itself is relatively very safe surgical procedure. Fat cells are injected and taken into patients’ tissue, which gives long-lasting and aesthetically pleasing results. As excess fat is taken out from thigh or abdomen, there is additional effect of liposuction. 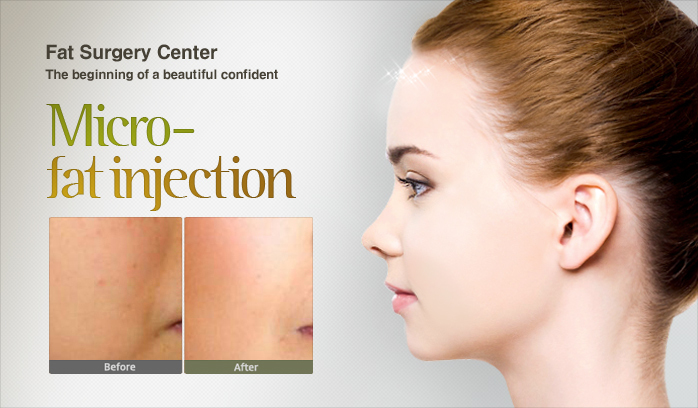 Micro-fat injection gives more natural and soft facial contour than artificial filler materials. While artificial fillers requires large amount of fillers and high cost, micro-fat injection has less restriction in the amount of extracting fat and overall costs are less than in artificial fillers. We can keep micro-fat frozen for 1-3 months and reuse it when patients or surgeons need for re-injection. Throughout the surgical procedure, simple local anesthesia alone is fully sufficient without patients’ discomfort. There is almost no limitation of daily living life; recovery time is relatively very fast and patients usually return to work place 1 or 2 day after the surgery.